Online retail store Amazon is starting its Great Indian Sale from 12.00 am, 21 January 2018, which will end on 24 January 2018. The sale will start at noon on 20 January for Amazon Prime members. The company is offering discounts on various products including smartphones, consumer electronics, fashion, home & kitchen, large appliances, sports & fitness, TVs and more. 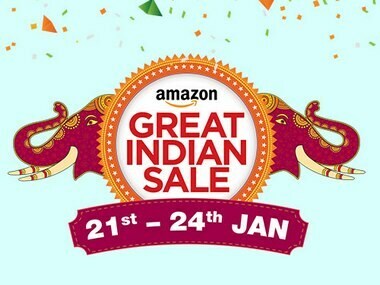 Amazon Great Indian Festival sale begins. Amazon. Amazon is launching Samsung A8 Plus, On7 Prime, OnePlus 5T Lava Red and LG V30 Plus Blue variant during the sale. These new smartphones come with no cost EMI on credit cards and additional exchange benefit of Rs 2,000 on the new OnePlus phone and Rs 5,000 on the LG. HDFC bank Debit and Credit cards users will get 10 percent off as well, under certain conditions specified on Amazon. Prime members will be able to access the offers from 20 January onwards. A few of the exclusive offers for Prime members include discounts on the WD My Passport 1 TB Portable External Hard Drive, Canon EOS 1300D, several TVs and more. Other offers includes up to 50 percent off on JBL speakers and Sennheiser headphones, up to Rs 20,000 off on Laptops, up to Rs 50,000 off on Google certified Android TV (65-inch) from TCL, up to 75 percent off on bestselling software, up to 75 percent off on antivirus software and up to 25 percent off on Microsoft software. A 10 percent back up to Rs 150 on Amazon Email Gift cards. A discount of up to 40 percent on Smart TVs and up to 35 percent off on premium TVs from Sony and Samsung is being offered during the sale. Prime customers on Kindle Paperwhite and Kindle Paperwhite Starter Pack will be available with a discount of Rs 2,500 for the prime members and Rs 2,000 for non-Prime members. The company created 6,500 temporary jobs for the sale in India.